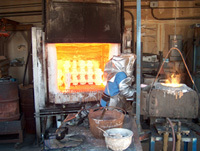 Molten wax is injection molded into a mold cavity to form a pattern or an exact replica of the part. The wax pattern is allowed to solidify in the mold cavity and removed. Each casting requires a pattern. Assembly: Numerous patterns (number varies depending on size and complexity) are attached or welded to a central tree trunk or sprue to form a wax tree. 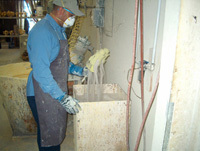 The wax assembly is thoroughly cleaned and immersed in a liquid ceramic slurry. This immersion process is repeated several times to form a hard shell or investment. The shell or investment has to be strong to withstand the thermal shock and tensile stresses created during subsequent operations. The shells are completely dried and the wax completely melted in an autoclave leaving behind a void inside the shell. The void exactly matches the casting. The shells are pre-heated in an oven to prepare them for thermal shock. 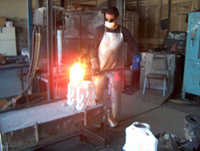 The appropriate metallic alloy is melted in a furnace and poured into the central sprue using a pour cup. The molten metal flows by gravity down the central sprue and enters the part cavities through portals known as gates. The ceramic shell is broken after the molten metal freezes. The parts are joined to the central sprue and need to be separated into individual pieces. The parts are cut off from the central sprue using a cut off saw. The parts are sand or grit blasted to improve their surface finish. 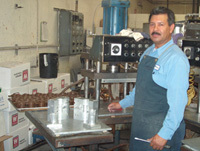 The parts are occasionally shipped to the customer either in this as cast condition or after secondary operations.